Orrin Hudson's adage: K.A.S.H. is King! "There is a crisis in American education today, and our future is at stake" says Orrin Hudson, founder of Be Someone, Inc. Educators today are faced with limited resources and increased class sizes. Feeling frustrated and in an attempt to satisfy their teaching requirements, they often find themselves teaching how to pass the requirements tests so students can move more smoothly through the school system, rather than teaching the cognitive skills necessary to clearly think through the problems or more easily retain factual data. As a result, our children are not learning to think in school. They are learning how to take tests and memorize facts that often hold no meaning for them or how the results are achieved. Be Someone's award winning program provides students with the tools necessary to instill confidence. They have mentored over 16,000 children, creating thousands of self-assured students who have developed complex thinking skills to solve problems. With confidence, hope and the skill-set to win, children are enabled to play the game of life like winners, creating success one move at a time. 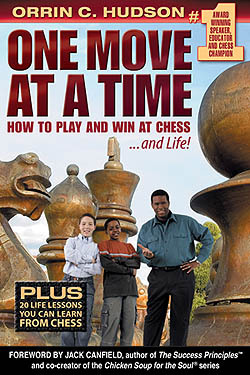 Orrin Hudson's newly-released book, One Move at a Time is now on sale for $14.95. Details at besomeone.org. Orrin C. Hudson, founder of an Inspirational and Educational Program, described a new currency of success that will take the nation by storm. His proposed "K . A . S . H . is KING!" program stands for "K = knowledge, A= attitude, S = skills, H = habits!" Hudson, a black motivational speaker has just released his 3rd book called One Move at a Time. 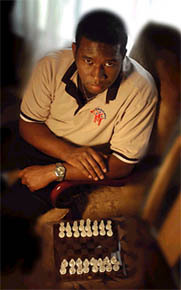 How to Win in Chess and Life… (To order your copy go to www.besomeone.org) He has created the non-profit organization to mentor inner city youth at risk of becoming lost to their potential. His award winning program has mentored over 16,000 students, and amazing results have been achieved in increased grade point average, classroom participation and attendance. Teachers who have worked with the students before and after the program, also report improved social skills, increased mental acuity, better concentration and overall better student behavior. Parents of the children are quick to praise the difference "Be Someone" has made in their children's lives. Hudson, a former state trooper and US Air Force veteran uses all his leadership skills to instruct students on life mastery techniques, teaching them how to "Think it out, don't shoot it out!" and "Push pawns, not drugs!" Hudson is planning a nationwide tour to major cities, bringing his "K . A . S . H . is KING!" concept to churches, community centers, schools and any venue that will open its doors to help improve the lives of children. Hudson says, "We need everyone's help! We want to partner with parents, children, civic centers and corporations. Our goal is to increase self esteem and good decision making skills in children in order to teach them how to be winners for a lifetime." Believe it. You can succeed at whatever you do as long as you simply make the right moves.